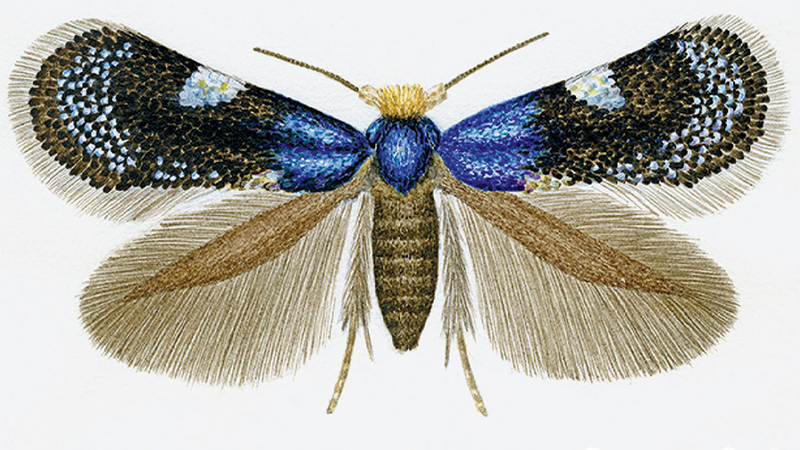 The leaf-mining pygmy moths (family Nepticulidae) and the white eyecap moths (family Opostegidae) are among the smallest moths in the world with a wingspan of just a few millimetres. 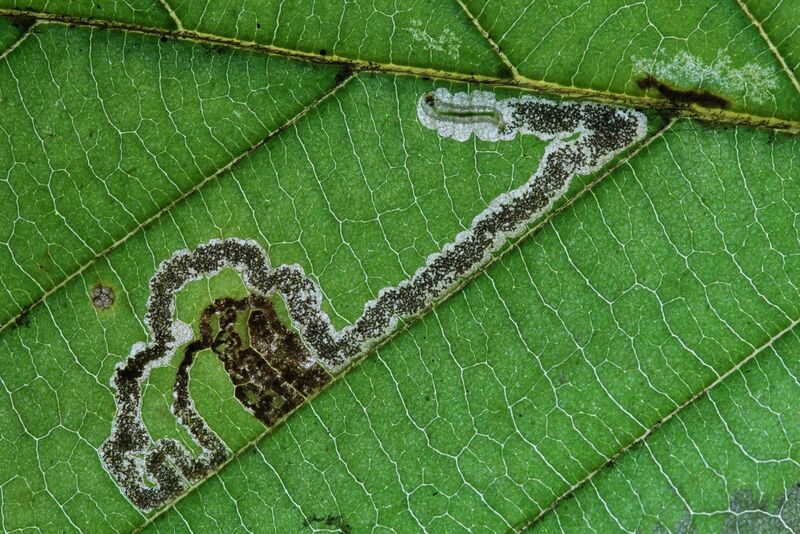 Their caterpillars make characteristic patterns in leaves: leaf mines. For the first time, the evolutionary relationships of the more than 1000 species have been analysed on the basis of DNA, resulting in a new classification. Today, a team of scientists, led by Dr Erik J. van Nieukerken and Dr. Camiel Doorenweerd, Naturalis Biodiversity Center, Leiden, The Netherlands, published three inter-linked scientific publications in the journal Systematic Entomology and the open access journal ZooKeys, together with two online databases, providing a catalogue with the names of all species involved. The evolutionary study, forming part of the PhD thesis of Doorenweerd, used DNA methods to show that the group is ancient and was already diverse in the early Cretaceous, ca. 100 million years ago, partly based on the occurrence of leaf mines in fossil leaves. The moths are all specialised on some species of flowering plants, also called angiosperms, and could therefore diversify when the angiosperms diversified and largely replaced ecologically other groups of plants in the Cretaceous. The study lead to the discovery of three new genera occurring in South and Central America, which are described in one of the two ZooKeys papers, stressing the peculiar character and vastly undescribed diversity of the Neotropic fauna. Changing a classification requires a change in many species names, which prompted the authors to simultaneously publish a full catalogue of all 1072 valid species names that are known worldwide and the many synonymic names from the literature from the past 150 years. Creating such a large and comprehensive overview became possible from the moths and leaf-mine collections of the world’s natural history museums, and culminates the past 35 years of research that van Nieukerken has spent on this group. 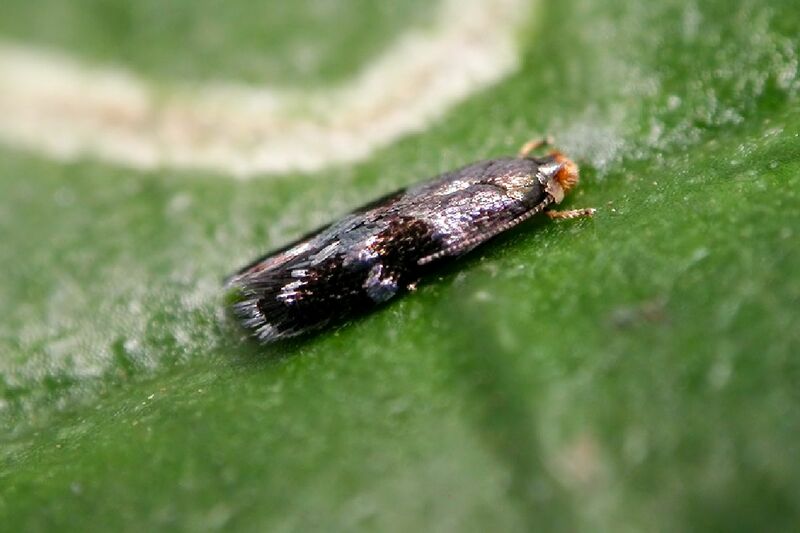 However, a small, but not trivial, note in one of the publications indicates that we can expect at least another 1000 species of pygmy leafminer moths that are yet undiscovered. Doorenweerd C, Nieukerken EJ van, Hoare RJB (2016) Phylogeny, classification and divergence times of pygmy leafmining moths (Lepidoptera: Nepticulidae): the earliest lepidopteran radiation on Angiosperms? Systematic Entomology, Early View. doi: 10.1111/syen.1221. Nieukerken EJ van, Doorenweerd C, Nishida K, Snyers C (2016) New taxa, including three new genera show uniqueness of Neotropical Nepticulidae (Lepidoptera). ZooKeys 628: 1-63. doi: 10.3897/zookeys.628.9805. Nieukerken EJ van, Doorenweerd C, Hoare RJB, Davis DR (2016) Revised classification and catalogue of global Nepticulidae and Opostegidae (Lepidoptera: Nepticuloidea). ZooKeys 628: 65-246. doi: 10.3897/zookeys.628.9799. Nieukerken EJ van (ed) (2016) Nepticulidae and Opostegidae of the world, version 2.0. Scratchpads, biodiversity online.